eCite - A Paleogene trans-Antarctic distribution for Ripogonum (Ripogonaceae: Liliales)? 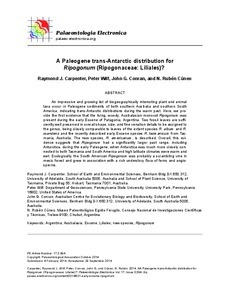 A Paleogene trans-Antarctic distribution for Ripogonum (Ripogonaceae: Liliales)? An impressive and growing list of biogeographically interesting plant and animal taxa occur in Paleogene sediments of both southern Australia and southern South America, indicating trans-Antarctic distributions during the warm past. Here, we provide the first evidence that the living, woody, Australasian monocot Ripogonum was present during the early Eocene of Patagonia, Argentina. Two fossil leaves are sufficiently well preserved in overall shape, size, and fine venation details to be assigned to the genus, being closely comparable to leaves of the extant species R. album and R. scandens and the recently described early Eocene species R. tasmanicum from Tasmania, Australia. The new species, R. americanum, is described. Overall, this evidence suggests that Ripogonum had a significantly larger past range, including Antarctica, during the early Paleogene, when Antarctica was much more closely connected to both Tasmania and South America and high latitude climates were warm and wet. Ecologically, the South American Ripogonum was probably a scrambling vine in mesic forest and grew in association with a rich understory flora of ferns and angiosperms.